Over the past couple of week, Sturm answered some questions for me over email, so as to provide a bit more insight into the creation of his manuscript and offered some ideas about the writing found within his book. Much of your first full-length collection of poems, How We Light (H_NGM_N BOOKS, 2013), contains material from four chapbooks that were released over the course of the past couple years. I was hoping you could talk about the process of re-imagining these poems in service of a broader context. By that, I mean, how did your relationship to these particular chapbooks (and the poems therein) alter or shift during the sequencing process? Did you learn anything new or different about them when considering their placement in the book? What types of resonances did you discover between them? To that end, were there any points of friction or dissonance that were problematic for you or need to be resolved? How did the publication of these chapbooks help you along, ultimately, in the development of How We Light? Chapbooks deserve their own lives as chapbooks. They’re a vital publishing form – intimate, textural, concentrated, audacious. They put pressure on how we think about and about making books. Which is to say I don’t think chapbooks exist only to serve what we call, simply because of quantity, full-length books. Four chapbooks that come to mind as resolutely full-length, however you want that to mean: Matthew Rohrer’s A Ship Loaded With Sequins Has Gone Down, Bernadette Mayer’s The Helens of Troy, NY, Carrie Lorig’s nods., Dana Ward’s The Squeakquel. Thinking about this answer, it’s important for me to say that when the process of talking about the book began I did not have a “complete” book, not at all. Nate Pritts, the editor-hero of H_NGM_N, and I had a long conversation about this exact question: how do chapbooks come together into a book? At first I resisted dismantling the chapbooks to make a book, but the problem was exactly that I was thinking about the process as “dismantling” – the chapbooks have their own autonomy and time – it’s not possible to take them apart. But I couldn’t really account for the parallax between the chapbooks and the time of the book until I had newer poems to stand in. 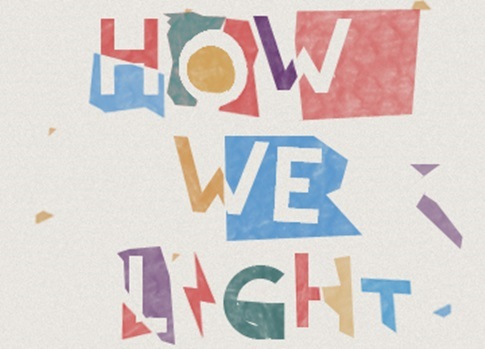 Once those poems existed, the shape of How We Light became intuitive. I realized I didn’t have to “make” an organic emotional structure – I had to grow it, get wet in it, be hurt by it, and that’s mostly a matter of failing, flailing, and having fun. How We Light contains two long poems: the title poem, located midway through the book, and “I Feel Yes,” which concludes the collection. Could you talk a bit about long poems, generally speaking: What do you they offer you as a writer? What long poems by other poets have influenced your writing? Why and how? How does your process differ when composing a long poem? What are the difficulties inherent to that process? More specific to How We Light, how do you think the two poems in your book affect the reader’s experience, as well as alter or shift the manner in which we read the shorter poems? For a while I was only writing poems that fit on a page, and that was necessary – I needed to write a lot of poems. As you’ve talked about, most of the poems in my first chapbook, What a Tremendous Time We’re Having!, play around the shape of a sonnet – they’re all quite dense. When it came out, my reaction to its material presence in the world was to write something sprawling and digressive. I had been reading Anselm Berrigan’s book-length poem Notes from Irrelevance and Padgett Powell’s novel of questions, The Interrogative Mood, and I sat down and in one weekend wrote “I Feel Yes.” At the time, it was a way of unbalancing myself. Going past the edge of the page over and over was exhilarating, if only because I was curious to know what would happen if I kept not stopping. Over the last year I’ve been mostly only writing long poems, which means I haven’t been writing many poems. But that’s not true. I have been writing a lot of poems, they’re just absorbed into larger patterns after the fact. The idea of writing a discrete poem on a single page is kind of impossible to me right now. And that’s not a choice I made. The radical shifts in the textures of the circumstances of my life made long form poems a necessity. As far as process, it means my thinking is more accumulative, disparate, open-ended. I never feel like I’m finishing anything anymore. That makes me anxious and unbounded at the same time. Sometimes it feels more like translating than writing, as if there’s an original poem somewhere, I don’t know where, and I’m slowly distorting it into this new thing. Nevertheless, I spend the time there because long form poems allow for collaboration with the indeterminate, self-reflexive mystery and magic of the forces that I feel most (non)human inhabiting. In How We Light, I imagine the long poems making the other poems forget they are poems. I mean that they might create the possibility of poetic potential that is greater than any distinct poem. No one wants to just read poems. What types of projects or poems are you currently working on/writing? How do you see your newer poems working with (or against) the poems in How We Light? Is there a development or progression in your writing that engages or moves away from your previous concerns? How so and why? I can’t seem to write if I’m not writing with someone else, so a few collaborative projects with the usual suspects have been underway. More than anything right now I’m just soaking in things. I’m taking three amazing classes, a theory survey, Postmodern Tragedy, and Žižek’s Politics, that are stretching and overlapping all the patterns, and teaching two classes, one on Postmodern Joy and another on short story and short film. Jeff Hipsher and I started a new reading series in Tallahassee called Dear Marge, Hello. I’m watching a lot of Ingmar Bergman and Woody Allen movies. I read and loved Lisa Jarnot’s biography of Robert Duncan. I’m helping edit an essay-anthology of experimental female poets for The Akron Series in Contemporary Poetics. I’m eating more obscure fruit. I was lucky to be able to spend most of August doing a tour of readings from How We Light and after spending over 4,000 miles with those poems and friends I was able to see the shape of a new manuscript called Outside in the Aporia Days. It has an epigraph from a Prince song. I don’t know, but I want that to be a sure sign of progress. One of the new poems is here in PEN. Whatever this book turns out to be, it’s coming out of my obsession with long poems, which doesn’t necessarily mean my concerns are changing, just transferring. I recently edited an issue of NÖÖ Weekly focusing on long poems and sequences – I am letting those poems and poets permeate me. I’ve been working to be more permeable in general lately, more weather-like, amalgamated. I have a reading list for the winter that includes Alice Notley, Jules Verne, and Peter Sloterdijk. Other than that, I’m happy to watch so many other poets’ successes lately, like forthcoming books from Tyler Gobble and Alexis Pope, both from Coconut, and Mike Krutel’s chapbook Best Poems from Big Lucks. I’m just going to keep writing poems with these people until everything is a skylight.